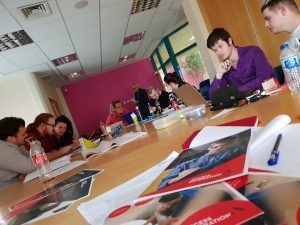 We’re pleased to announce that our youth employment accessibility research is being utilised by the Prince’s Trust initiative, Talent Match Middlesbrough. Companies based in Middlesbrough will have their jobs/careers section on their website assessed against young people’s expectations in a bid to show local employers the problems young people have in gaining work. Our youth employment accessibility assessment was designed by young people with the support of Talent Match Leicester. So this week, we took two of our young peer researchers to Middlesbrough to train three new peer researchers. During our peer training session, we did some sample scoring on some local companies to make sure everyone was comfortable with the process and methodology. The new cohort of young peer researchers based in Middlesbrough will be scoring local companies over the next month. We will then be running a free half-day training workshop in Middlesbrough in early November. Look out for details on this event in the coming weeks on our events page.